Lately she has also focused on the clavinet, an electric piano from the 60s with strings and metal chimes, where she engages with noise and more visceral sound material, equally extending the instrumental sound palette using extended techniques and devices. Current projects are "Spill", a duo with drummer Tony Buck, a duo with Anthea Caddy (cello), a duo with Christine Abdelnour Sehnaoui (sax), "Great Waitress", a trio with Monika Brooks (acc) and Laura Altman (cl) and different collaborations with Andy Moor, Clayton Thomas and Peter Evans. 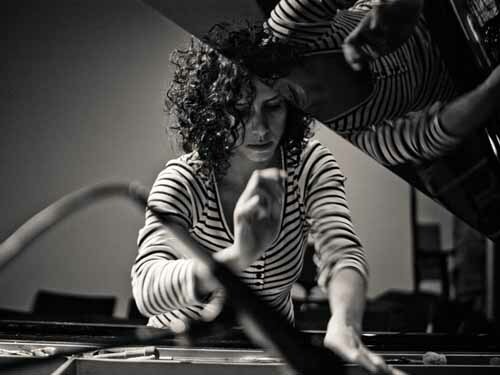 Magda Mayas has performed and toured in Europe, the USA, Australia and Lebanon and collaborated with many leading figures in improvisation and composers such as John Butcher, Peter Evans, Annette Krebs, Phill Niblock, Andrea Neumann, Axel Dörner, Thomas Lehn and Tristan Honsinger.